The Scorpion is a 26 ft. center console that is the perfect vessel to pursue all of the game fish that the Sea of Cortez has to offer in style. 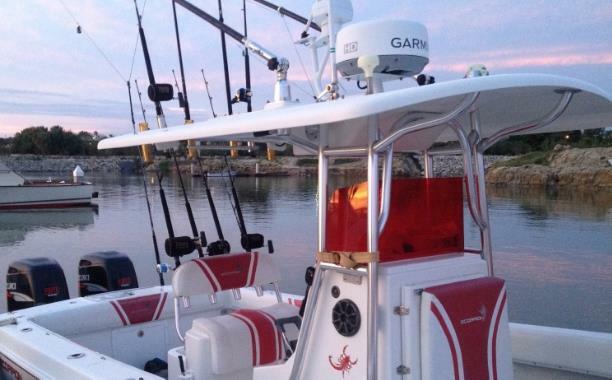 This lean, mean, fishing machine comes equipped with advanced marine electronics, two live wells, outriggers, SXM radio rigged to a Kicker system and all of the latest safety features needed for a great day on the water. Roosterfish, pargo, sierra and pacific jacks are just a few of the species that one can expect to catch on an action filled day fishing close to shore. The Scorpion quickly distinguishes itself as a superior fishing option to the more traditional pangas and cruisers of the area. Comfort, speed and professionalism together with the latest in gear, tackle, and techniques combine to offer our guests the finest fishing experience available. The open design of The Scorpion ensures that both crew and client can maneuver around giving the angler options on approach as conventional, light tackle, and fly rods can be deployed at a moments notice for a variety of species. With the ability to get to where the fish are biting quickly, thanks to our twin Suzuki 250's, anglers will spend more time on the fish and less time running from spot to spot. We also have numerous fish boxes to ice down your catch as well as a huge Yeti cooler (for cervezas and other beverages). The Sea of Cortez is one of the most prolific fisheries in the world and whether it be conventional, light tackle or fly, Scorpion Sportfishing is proud to be one of the best on The Cape at targeting the big boys. Bluewater species that we cover include marlin (striped, blue, black), sailfish, tuna, dorado (mahimahi/dolphinfish), and wahoo. Everyone knows that the boat you are on is only as good as its gear! Here at Scorpion Sportfishing we take our angling seriously (seriously focused on fun!) and only use the best and most up to date gear on the market. That means Shimano reels spooled with Power Pro braid to Momoi leaders on Seeker rods. Whether you are using our Tiagras to battle a huge blue, the Talica two speeds to whip a tuna, or the spinning reels to boat that epic pez gallo, The Scorpion has got it covered so you can focus on fighting your lifetime fish. We also employ all the latest in artificial baits from the likes of Black Bart, Zuker and Marlin Star to name a few (we got it all including kites and wahoo rigs). For fly fishing gear, we use Winston and TFO rods fitted with Hatch reels. All reels are spooled with 50 lb.gel spun braid to Rio lines and Rio flurocarbon leaders. We also hand tie some of the finest flies in use on the East Cape that will follow the most effective hookless teasers rigged and ready to throw. Outfitted with twin four stroke Suzuki 250's The Scorpion not only has the ability to find the fish but gets you to them in a timely manner and keeps you on em' all day. Price includes all rods and reels needed ( Shimano Reels and Seeker Rods for gear and Hatch Reels and TFO Rods for fly) as well as all tackle, ice and bottled water. Fly fishing focused charters are available (to be accompanied by a US fly fishing guide aboard The Scorpion add $150.00 USD). Rates do not include 16% IVA tax, bait (about $20.00 USD. ), Mexican fishing license, food, beverages or gratuities for the captain or guide. "Scorpion Sportfishing promises to provide a professional, quality charter and guide service to all our clients regardless of skill level. It is our goal to help clients become better anglers while ensuring each guest has a memorable and positive experience while in our care."